It is always the pleasure of a new parent to feel overwhelmed by the several demands of the latest family member; the infant. These fresh requirements make the task of overlooking the significance of the newly born baby’s hair look inclusive for the person responsible for the baby’s care. There is usually a great need of making shampoo a baby’s fascinating experience while it still has quite little hair. However, several young babies don’t like their hair being washed or treated at all. But through establishment of good habits in time would make the baby to get used to practicing good hair care practices. When do babies start growing their hair? Research by most experts indicates that babies grow their hair follicles by the time they are six months in their mother’s womb. Sometimes, the hair stars to be spotted on sonograms on its head. The amount of hair the baby has at birth time, however, varies with others. Most babies have their initial growth falling out in the first few months and replaced by more textured thicker one. To encourage healthy development of the hair, it would be advisable to maintain the baby’s head and hair clean even if it has a bald head in the first months of its birth. Although some people indicate that shaving the head of the baby would result to its hair becoming thick and full on the head, this remains to be just a myth since there is no evidence which links shaving of hair and its rapid growth. But the hair merely seems to grow faster than usual if it is shaved. What care do they demand? The baby’s hair demands a bit of personal care even if it has little peach fuzz that covers its head. There is need to be treated with the utmost attention it needs. Such a practice make the baby appear so cute, having the best feeling and even ever ready for any close-up snaps which they might be taken. Taking care of the baby’s precious hair does not take much. An infant shampoo is all what is needed for this exercise. This shampoo however should be fresh of perfumes and detergents which might lead to allergy. The shampoo should not also cause irritation on the eyes of the baby and should not have sulphates as well. To save the much hustle, a tear-free option would be appropriate. In case it is not available, a washcloth which would be employed in the entire washing process would do the work as well. It would help one rinse away the washing shampoo. To maintain the baby’s health and keep its scalp moist, one can make use of mineral oil. This is more important during winter dryness. The practice of taking care of the babyshould be made a natural part of its bath routine. You can pour some shampoo meant for the baby on it head especially when it is still very small and rub the head gently. This needs to be done with use of a soft spot which should also be rinsed and used again to wipe off the washing shampoo. This should go on until the shampoo is fully rinsed. In cases the baby has some control; one can use their hands to scrap its head as they pour water over its head using a cup in order to rinse the washing shampoo. The baby does not need to have its hair washed with shampoo every day especially in its first months. Shampoo can be employed once a week or two. If you feel that there is need to do away with any kind of grime, you can wash its head with plain water. This happens so because you are already giving a bath more often than normal. The rate of washing per week goes up as the baby gets more active hence having more sweat and dirt. Sometimes you can find that even after doing the proper washing, there is some cases of extreme crusting and flaking. This however should not be a cause of alarm since it is a common happening in infants. It is usually referred to as cradle cap. In case this worsens, then there is need for you to consult your physician regarding the possibilities of changing the washing shampoo or including any other kind of treatments. This should be encouraged especially when signs such as rashes that are making the baby uncomfortable are exhibited. This cradle cap can be treated even before seeking more help. Scrub the baby’s scalp softly every time you wash it. It can also be removed with the use of a washcloth, soft brush or even a baking soda while keeping it with moisturized mineral oil. A soft massage can also help to make the flakes loose, although scraping should never be done on the baby’s soft spot. In cases the baby has its scalp with red or flaky skin and the washing shampoo does not seem to heal this, the pediatrician has to give prescription of the necessary medications for such a situation. 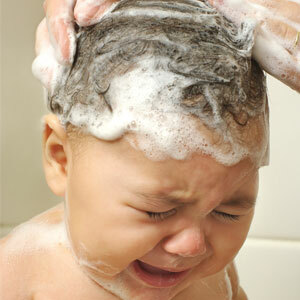 Combing the infant’s hair would make its tangles to go away even before applying the shampoo. How to comb the infant's hair? In addition to shampooing there is also need to comb the baby’s hair. While several babies are born with hair that is usually thick, others have little or no hair at all. The infant’s hair is naturally soft; therefore great care should be administered while washing it. Holding the babytightly well without reclining it gently would make the hair exercise for the baby an enjoyable practice for both the baby and you. It makes the baby feel secure and avoid the more reflexing and frightening experience which might happen momentarily if it is reclined. As you wash the baby it is advisable to sweet talk it in a more comforting voice tone. This would assist in putting the baby at ease and probably make it more likely to keep on enjoying the practice of scalp and hair care as it grows up.